Barron's: 2016, 3rd ed., 466p. 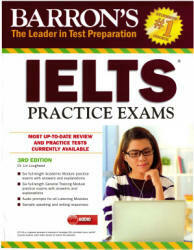 This newly updated 3rd edition with MP3 CD prepares test takers for success on the IELTS, an English competency test that’s recognized by more than 9,000 organizations in over 145 countries. The program presents: Six full-length Academic Module IELTS practice exams with answers and explanations Six full-length General Training Module IELTS practice exams with answers and explanations Audio prompts for all of the tests' listening modules Sample responses for the writing and speaking modules ESL students can increase their language fluency by using this book and MP 3 CD package alone, or they can use it along with Barron’s IELTS, Essential Words for the IELTS, and IELTS Strategies and Tips, all of which contain extensive practice and review for all of the IELTS test sections. This book contains six complete Academic Module tests and six Reading and Writing sections for the General Training Module. The IELTS has four sections: Listening, Reading, Writing, and Speaking. The listening and speaking sections are identical for both Academic and General Training test takers. Therefore, those two sections are not repeated in the General Training part of this book. Students who are studying for the General Training module should use the Listening and Speaking sections of the Academic Module tests, and turn to the General Training part of this book for the Reading and Writing sections.